Mr Kwasi Amoako-Atta, Minister for Roads and Highways, has assured residents of Zongos in Ghana that his ministry will collaborate with Ministry of Inner Cities and Zongo Development to ensure that roads in the communities were constructed. He said, starting with the Madina Zongo community, the ministry will prioritise the development of roads in these communities in order to bring them up at par with other communities in the country, in line with President Akuffo Addo's vision for the creation of the new ministry. He said this at a durbar with the Madina Zongo community after touring some roads in the area. He said within the next few months, the ministry of roads and transport would ensure that a few of the roads, which were near completion, but had been abandoned by the contractors for non-payment of fees, were completed. He stated that he would review the contractors' Interim Payment Certificates, meet the contractors and ensure that they were paid as part of the next payments to be made under the road funds. He said this process would be done as soon as possible so that the contractors could complete the work before the rains start, to avoid eroding the work that had already been done. He said Zongo communities were behind in terms of development of infrastructure thus the need to bring to bring them up to speed with other parts of the country. He also bemoaned the use of roads and pedestrian walkways as markets and admonished the residents to desist from such acts when the roads were constructed and also advised to drive well, as accidents on good roads were more dangerous than those on bad roads. 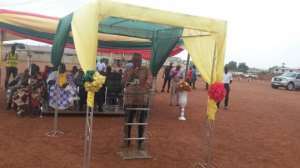 Alhaji Boniface Abubakar Sadique, Minister for Inner Cities and Zongo Development and Member of Parliament for Madina Constituency, said the event was to kick-start the development of roads in the Madina Zongo to complement the construction of the Astro-turf Park in the community. The project is a multipurpose park that would include; a gym, basketball court, Football Park, clinic, mall and others that would serve the community. He said the integrated approach to the developments in the area would elevate the status and standard of the place. The team toured roads including the UN, Washington, Melcom P&T, Melcom Pentecost, Redco flats and Libya Quarters roads.